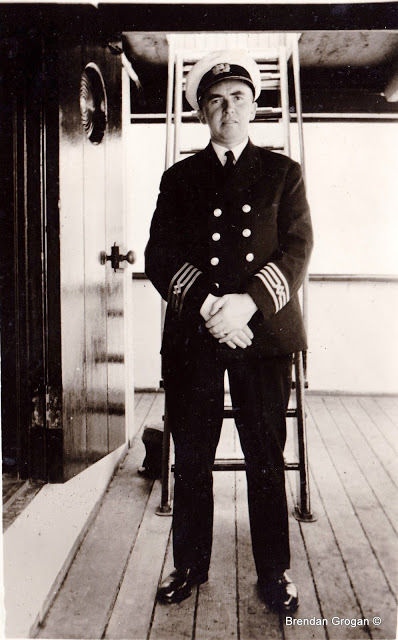 In our first guest blog 2018, Brendan Grogan brings us this wonderful summary of the life and maritime career of Captain Richard Farrell. Captain Farrell, as I always heard him referred to, was highly respected in his role as Harbour Master, but then again having seen it all and done it all as a seafarer he had a unique perspective on what it takes to run a port safely and efficiently. 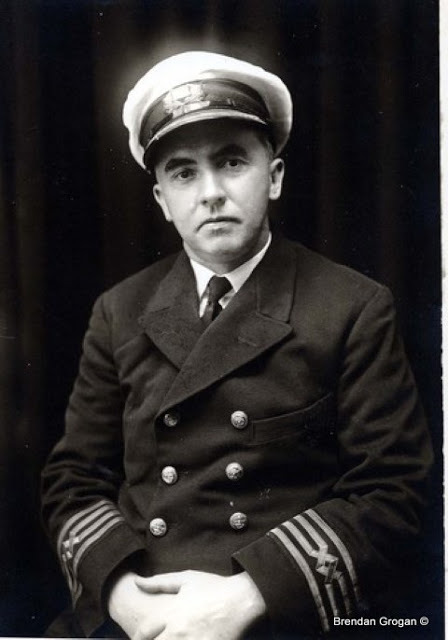 Captain Richard Farrell became Waterford Harbour Master in 1941 at the age of 44 on the retirement of his uncle, Walter J. Farrell who had held the position since 1903. He was the youngest child of eight children and only son of Richard Farrell (1869 – 1939), a shipbroker in Waterford. His first wife Frances Harbison whom he married in 1919 was a nurse, she died in 1953. In 1963 he married Maeve Kenny and they lived at ‘Trade Winds’ on John’s Hill. Maeve passed away in 2017 in her 104th year. S.S. Medic, Steamer, 1913-1915 as Deck boy. In an interview with Tom McSweeney for Seascapes, Captain Farrell at age 95 gave chilling accounts of his voyages around Cape Horn in four masted Barques and also of his involvement landing the Munster Fusiliers at Suvla Bay during WW1. 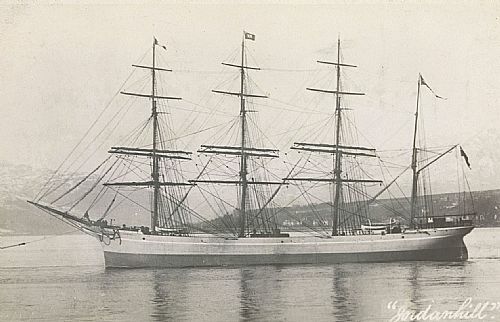 I had a mind to join a sailing ship and secured a berth as Ordinary Seaman on the S.S. Jordanhill, a steel sailing vessel built in 1892. 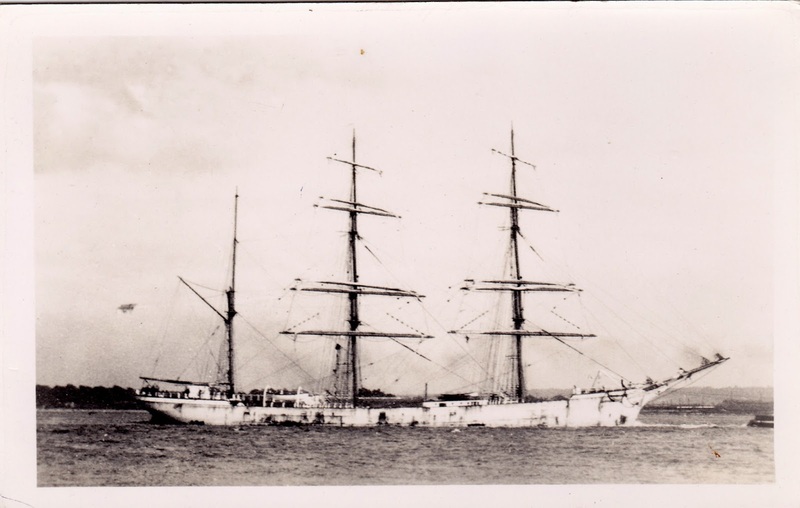 This four masted square rigged barque was to be my home for this my first voyage around the world and so on 22nd of August 1915, the S.S. Jordanhill sailed for Port Arthur, Texas where we were to load case oil for Adelaide in South Australia. The ship was laden with 1,000 tons of clay ballast to provide stability for the voyage across the South Atlantic Ocean which lasted 42 days. On arrival at Port Arthur, the ballast was removed; this exercise took three weeks. The ship was then towed to the oil berth to commence loading the cargo of cased paraffin oil which was destined for the gold mining areas of South Australia such as Kalgoorlie and Coolgardie. The route from Port Arthur took the ship south out of the Gulf of Mexico towards the Equator and onwards east around the Horn of Africa. After one hundred and forty eventful days at sea, the Jordanhill arrived at Adelaide, Australia on the 10th of June 1916. After the cargo was discharged, clay ballast was again taken on for the next leg of the voyage. It took ten days to sail to Melbourne where the ship was to take on a cargo of wheat and then head east round Cape Horn and head for home. The ballast was again unloaded and a full cargo of wheat in bags was loaded to the Jordanhill. She was again down to her plimsoll marks. 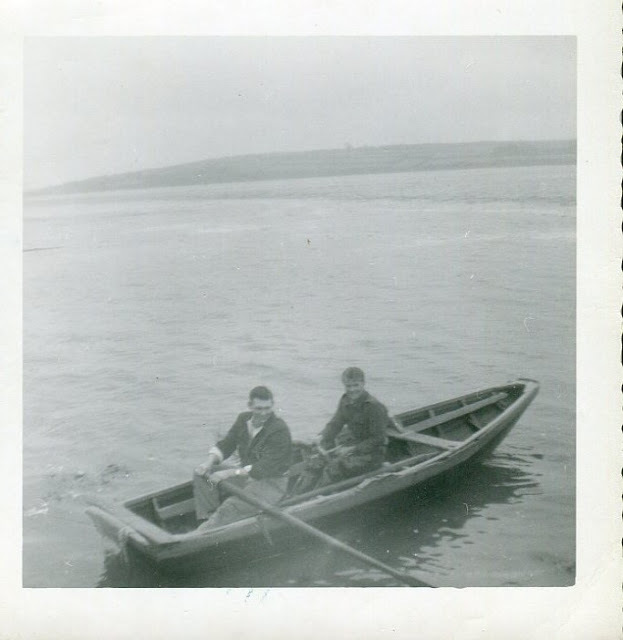 We were towed out to Hobson’s Bay the 10th August 1916 with instructions to head for Falmouth for further orders. On the 1st November, 83 days out, one of the hands working on the main royal yard sighted a steamer coming up from astern. It was my watch on deck and we were told to get the lifeboat ready for putting over the side. When the steamer got near, the Captain ordered the signal ‘we are short of provisions’ to be hoisted. 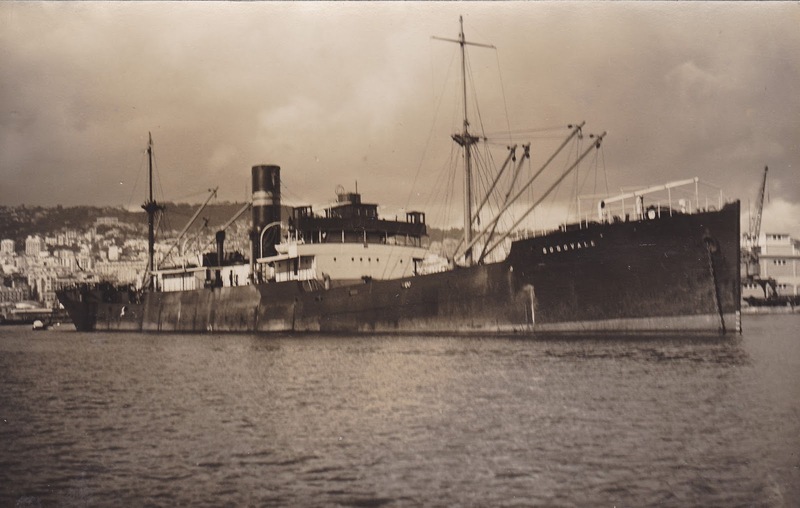 The steamer was the S.S. Alkaid of Rotterdam bound from Rosario with grain for her home port. She hove near us and the 2ndmate, three others and myself manned the boat and set out towards the ship. The 2nd mate informed the Captain of the Alkaid of the items that we were in short supply of. We made two trips back and forth with bags of coal, sacks of flour and other provisions including a small keg of claret and cigars for Captain Roberts. The Captain of the Alkaid allowed us on board for a drink. I did not drink at the time but the temptation was too great and I in common with the others got a very liberal tot of schnapps. After thanking the Captain again, we all went on board our own boat again. Our boat was full up with sacks of coal and flour and going down the rope ladder I felt very elated, not being used to liquor. I stepped on to the bags, staggered and fell over the side much to the amusement of the Dutchmen looking over the steamer’s rail. The others pulled me in again quickly as sharks abounded in those waters. Later the Old Man (Captain Roberts) called all hands aft and gave them a small glass of the claret. He and the officers were smoking cigars for the next few days. At about seven p.m. one evening, the wind shifted to the North West in a heavy squall. It continued to blow a whole gale and the sea became very confused. She shopped one heavy sea forward and stove in the forward deck house which was made from teak and the same sea caught a young Dane name Hansen and before he could grab the lifeline he was taken overboard and never seen again. He was only twenty-one years of age. We soon picked up the North East Trades and set everything, royals, flying jib, staysails, spanker and gaff topsail, sailing ‘full and bye’, that is about half point or so from the wind. This was really exhilarating, sailing with the Jordanhill leaning over like a yacht with all sails drawing and doing about ten knots. S.S. Jordan hill, steel barque, built 1892 by Russell & Co., Glasgow, 2291 GRT. Getting nearer the English Channel, we were getting a bit anxious about German submarines, as when leaving Melbourne, we had heard that they were getting very active. We had no means of knowing how the war was going. On 23rd of December we sighted the Lizard Light in Cornwall. We ran up our numbers and reported to the Light House. They signalled back ‘You are to proceed to Le Havre, your cargo is for the French Government’. On Christmas Eve, we sighted the Casquets Light on the French coast. At daylight, a French destroyer came close to us and threw us some French papers. On Christmas Day we were tacking very hard every four hours, next day we had lost sight of land but picked it up again in the morning under short sail. On the 28th December, a light cruiser (D19) took us in tow using a brand new 3 1/2inch hawser. She was indeed powerful and we were towing at about ten knots and everything held. When we got into Le Havre the cruiser let us go and we dropped anchor. The following day we were taken to our berth after 141 days at sea. The whole voyage had taken some seventeen months. 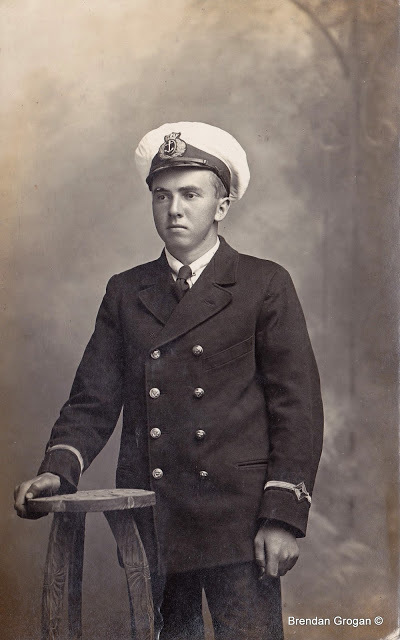 Richard Farrell, 2nd mate S.S. Killoran 1918, age 21 yrs. S.S. Killoran, built 1900 at Ailsa Shipbuilding,Troon. S.S. Gogovale, built 1927, 4586 GRT, anchored off Algiers 1935. 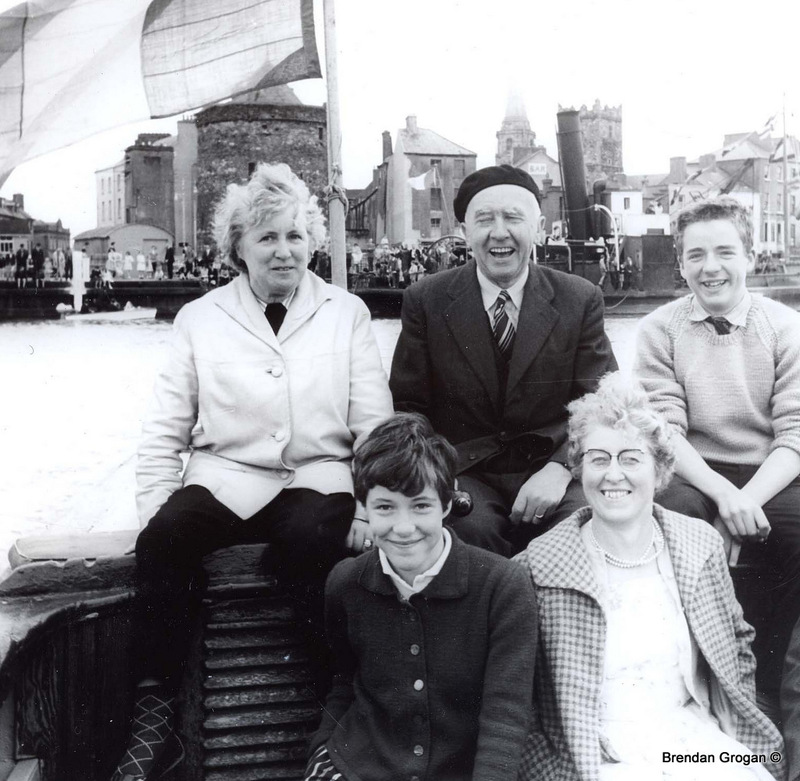 Regatta Day Waterford c.1963. Captain Richard Farrell & wife Maeve, with Grogan family. 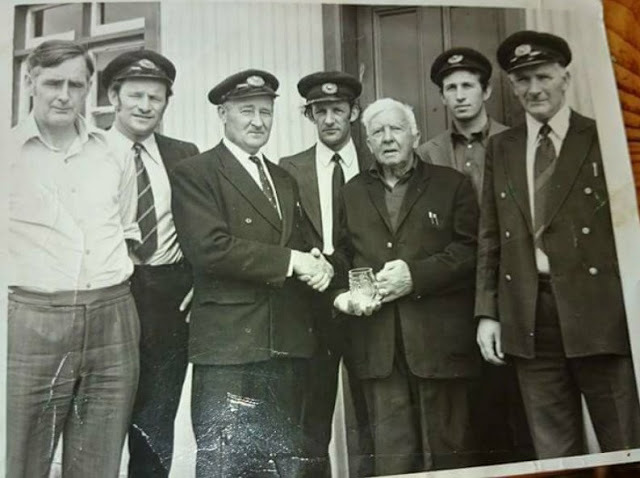 L-r. Paddy Hearne, Michael Walsh, Pat Rogers, Willie Walsh, Captain Farrell, John Walsh and Willie Hearne. The occasion is the retirement of Captain Farrell and a presentation by the river pilots of a piece of Waterford Crystal. Photo via Trish Last Cluney originally featured in the Munster Express Friday 8th Aug 1975. I’d like to thank Brendan for sharing this amazing written and pictorial account of the life of Captain Farrell. 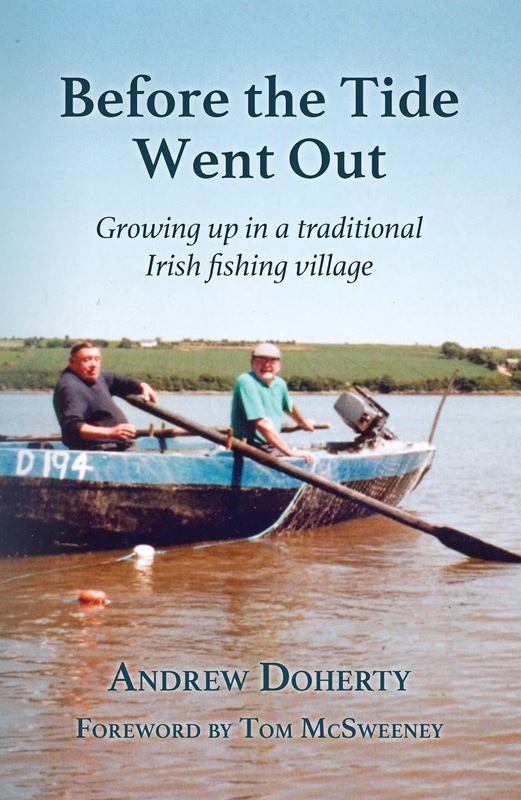 Our next guest blog will feature a maritime story from Tony Hennessey. If you would like to contribute a guest blog, which is published on the last Friday of each month, please get in touch by email to russianside@gmail.com. Over the past month I have commenced a new part time role with Faithlegg House Hotel. Under the direction of the hotels senior management team we have initiated a process including amongst other elements, gathering the stories of the residents/employees of the estate. This will assist in the current heritage re-brand of the hotel which seeks to showcase the amazing history of the area. 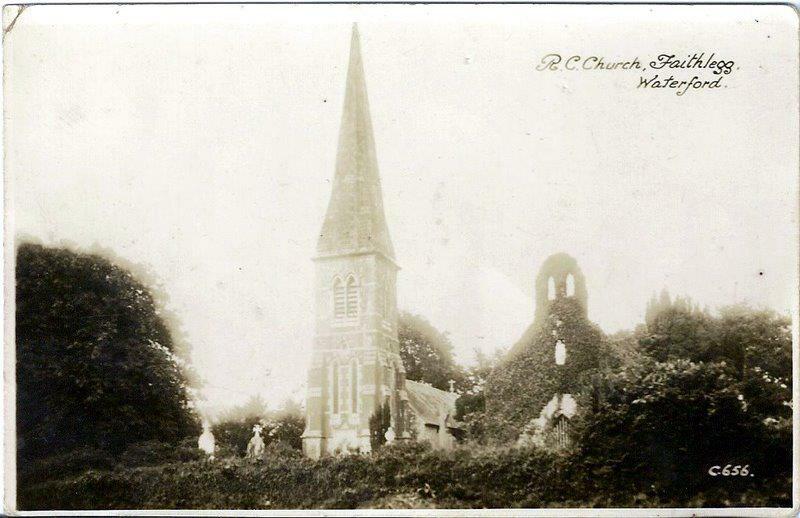 To whet appetites here is just one story that has emerged giving a greater insight into the building that is Faithlegg Church. 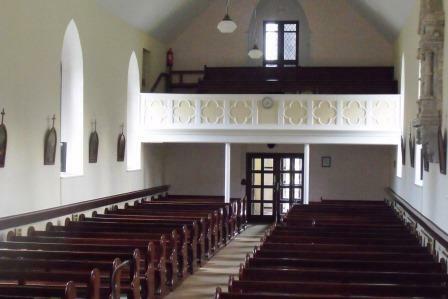 We have spoken before about Faithlegg Church, built in 1824 under the direction of the new landlord to Faithlegg, Nicholas Mahon Power. Nicholas died 1873, which corresponded to completion of a refurbishment, similar in most respects to the church that we see today including its impressive spire and belfry. But the work was not without it’s problems and thanks to a legal squabble afterwards(1), we can now look more closely into the project. As often occurs, not long into the building project new ideas surfaced. It was claimed the Power sisters, Nicholas’ daughters, cajoled their father into extending the build. The plan for an 80 foot spire was increased to 120 foot. 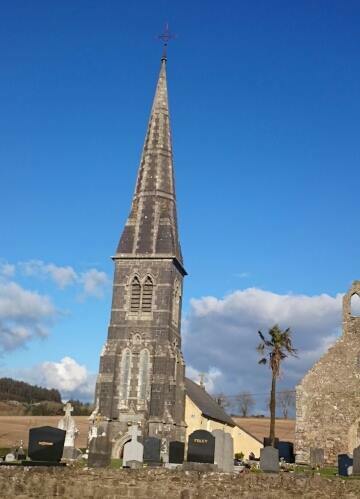 It was claimed in court that this was to compete with a neighbouring church and to ensure Faithlegg would be more beautiful, more imposing and to ensure it would outshine it. Nicholas it was said was not known for “being liberal when it came to improvements” but the ladies got around him to “flatter their tastes”. The gallery and behind the doors the private seating area of the Power family. But the demands were not yet finished. Apparently a belfry was an after thought. As it was at this point a new bell was requested costing £75 and an extra £10 to hang it. And still more adornments to to the spire costing £44 12s, which one imagines must have been the alteration and louvered timbers to emit the sound. The work was completed by a new mausoleum to the family and a walled in space to set it apart from the rest. This was said to cost £30. Still to be seen on the right as you walk in the main gates. It would appear that Nicholas never lived to see the entire project completed, he died in February 1873. But in 1876 Broderick took a case against the estate to secure monies owed from the drawn out and every changing refurbishment. His day in court saw him demand a sum of £207 10s 1d as a balance of his account. A decision was returned in his favour, but for a sum of £160. Although some of his workmanship was called into question in court the Buildings of Ireland has stated in their appraisal “…The construction of the tower attests to high quality local stone masonry and craftsmanship, which is especially evident in the fine carved detailing throughout…” And whatever the claims in court in relation to the wants and desires of Nicholas’ daughters, and the spire that spiralled out of control, their vision and resolve to cajole their aging father has left us a building that is a gem and has become one of the countries wedding venues of choice. (1) Waterford Standard 19th July 1876. P.2. (2) For the work described this seems a small sum. Last year I wrote about the astonishing flotilla that departed from Passage East for St James Fair in Bristol in 1635. I’d long been aware of this connection of course, and particularly Faithlegg’s connection with the English city dating back to the Norman conquest. That said I’m constantly amazed at the level of trade that departed or entered Waterford harbour. Although principally embarked or disembarked for either the city or New Ross, the trade flourished in all the harbour villages and via the rivers far inland. Recently Andy Kelly loaned me a copy of an interesting book(1) chronicling some of the trade between us and Bristol. It makes for fascinating reading. In running to 1081 pages and detailing over a century of trade I decided to just look at one years trade, 1503-04 and to look at the quantity of journey and one ships manifest inbound and outbound. Most of the ships were trading with Waterford city, far fewer with New Ross at the time (at least in this record). The trade disputes with New Ross and the arguments over primacy had existed for many years before, and arguably still exist today. The first ship mentioned is bata (2) Lenard. 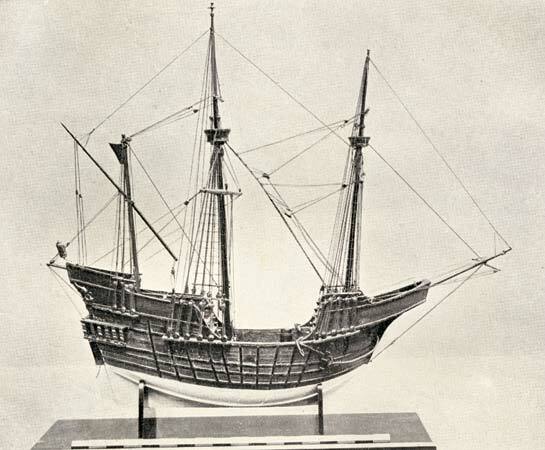 We can only speculate as to the size and design of the ship that was sailing the waters of the medieval ages. 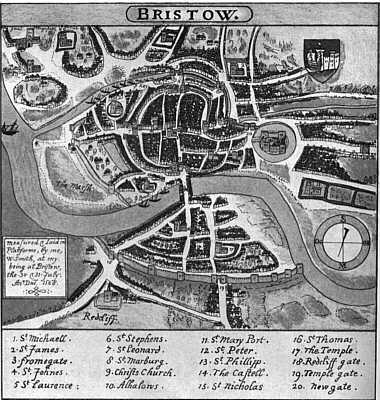 She arrived to Bristol from Waterford under her Master William Gombon 4th October 1503. 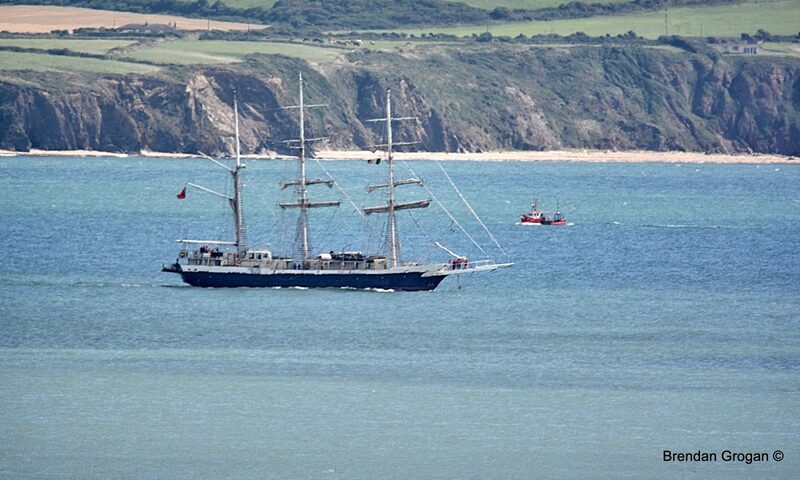 She departed for Waterford 20th October, arriving back to Bristol 16th December. She returned to Waterford in the new year, 17th January 1504. On the 4th October the Lenard was carrying manifest on behalf of several merchants; William Gombon (also her master), Walter Mothell, Thomas Langton, Philip Power, Robert Garvie, William White, Denis Ffolan, Peter Cassie, John Hyall, Denis Sherman, Peter Talbot, Thomas Axbridge, Patrick Kent and Robert Cransbie. 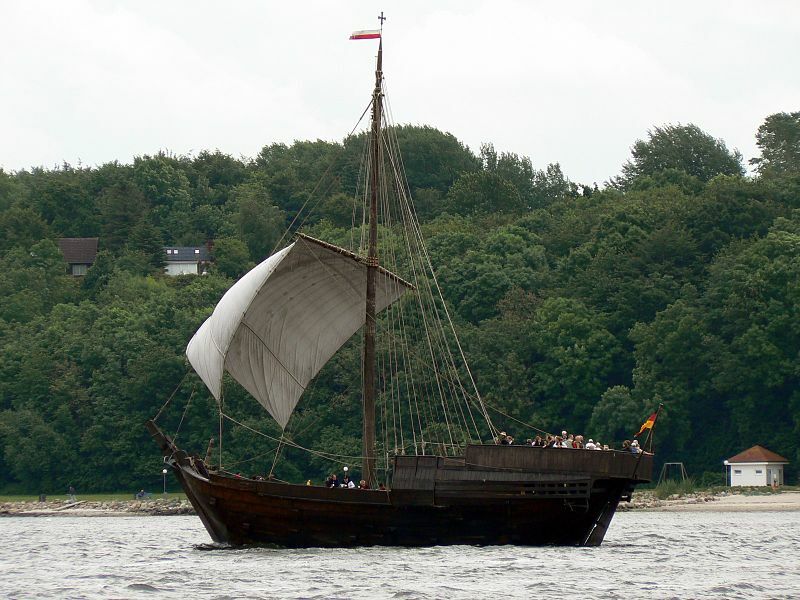 The Katren of New Ross under her master William Grase arrived to Bristol on the 31st January 1504 departing 13th February. She arrived back on the 22nd June that same year. I could not find a record of a departure. I could only find one other ship from New Ross in the period; the Miell under master William Blake. The Katern’s cargo of January was carried for William Grase, Thomas Bent, Patrick Kelly, John Clarke, Thoimas Shenell, Robert Laurens, Robert Grase and John Carpynter. The manifest was made up of fish; Salmon, Herring White and mantles. Other Waterford ships in this time period included; the Mawdlen under master William Power, the Trinite under master William Browne, the Clement under master Walter Barry, the James under master James Leach, the Mare under master Peter de John, the Savioure under master Thomas Meryn, and the Sondaie under master John Walshe. I can’t say that these ships were owned in Waterford. Indeed isn’t it also possible that they were bound from and/or to Passage East or Cheekpoint. A century on the exports of animal products were unchanged, but fish exports seemed to have dropped in favour of Newfoundland fish! The only real change is in the quantity and variety of imports into the Waterford area. So for example in 1601 Marie Busher of Waterford under James Baron master was loading for several days for the following merchants; Robert Cramsburrowe of Waterford, Robert Wealshe of Waterford, Walter Rian of Kilkenny and Pierce Vyne and Charles Strannge of Waterford. The manifest is vast and varied; foodstuffs such as raisins, ginger, currants, rice, and prunes. Hops possibly for brewing. A wide variety of ironmongery including steel, locks, bellows, rings, bolts, hinges, frying pans and pots. Lace, Paris silk, canvas, Milan Faustian cloth, Jean Faustian Cloth, bibs, cotton, taffeta, wool cards, threads, needles and hats. Soap was popular, glassware, looking glasses, playing cards, paper, inkwells, books for grammar, books cato and purile!? penners and inkhorns. The other change perhaps is that I would imaging the Marie Busher was a bigger vessel than those of 100 years previous. My thanks to Andy Kelly, without which this piece would not have been possible. For generations in the harbour here a small and awkward looking fishing craft was a constant feature. Called locally a Prong, it had a variety of uses which probably sustained its use for so long, but the origins of the craft are a mystery and almost now extinct, it is still remembered fondly in the villages and along the waterways where it was once renowned. Although no one knows for sure about the origins, the prong is arguably a descendant of the Norwegian Pramm, a seal hunting boat used in the frozen wastes of the Northern seas to traverse ice fields. Timber built with a transom stern and a distinctive sheer, the major difference is that the pramm/praem was generally clinker built. The Waterford variety is carvel built. (Locally it is said we changed to carvel bottom to reduce the noise while pooching salmon in the dark) My father had a tale when we were growing up of the first prong coming off a Norwegian schooner. As he told it, the schooner was moored off Cheekpoint, and the sailors came ashore to the pub. The locals thought it hilarious as the sailors left their boat in the dock as the tide was dropping. When the sailors emerged from the Suir Inn, the locals were at first astonished, and next very envious of their ability to regain the water. So much so, my father claimed, a plan was hatched to nab the boat and copy the design. Fact of fiction we may never know, but it was a good yarn. One story that does not feature in the booklet however was one my grandmother told me. 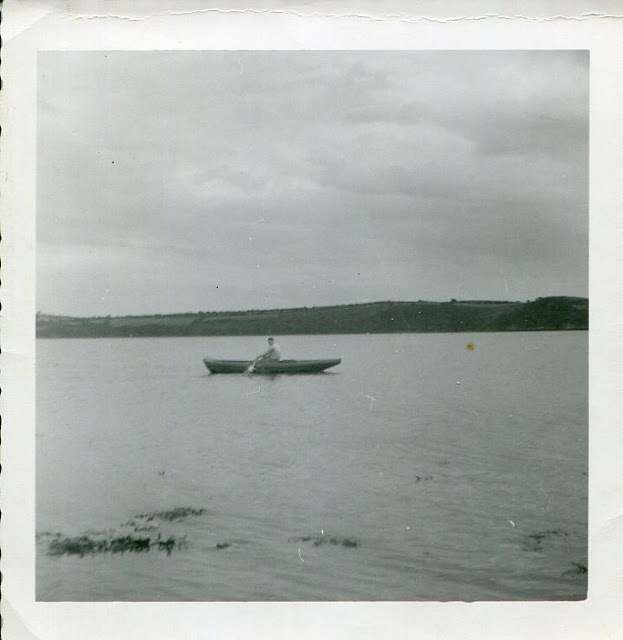 In the 1920’s when she was just a child (Nanny was born Feb 2nd 1919) her father went off to Waterford one day with fish to sell in the family prong (I’m fairly confident it is the same boat as photographed in the 1950’s). Later that evening he had not returned and the alarm was raised but as it was dark, little could be done except a vigil was kept through the night in the Russianside. At sunrise the next morning the local boats took to the water and the prong, which were always painted to blend in with the shoreline, was finally spotted. It was found having somehow drifted over the Shelbourne Banks and into the grass on the Campile pill. Fearing the worst they came alongside only to find her father sleeping off the effects of a mighty session. He had rowed out into the river and once the tide caught him, fell asleep in the bottom and allowed the prong to take him home! The prongs are now almost extinct, but a few remain, including my uncle Sonny’s which is in the National museum of Country Life in Turlough House, Castlebar, Co Mayo. The traditional skills building course in Waterford recently refurbished the prong featured in the video above, Paddy Doherty’s prong, which was paid for by his relatives. And Michael Bance with his pals rebuilt one in Woodstown as a project.